Celebrations are tricky. There is an overwhelming expectation that we should all be over indulging in both food and gifts. 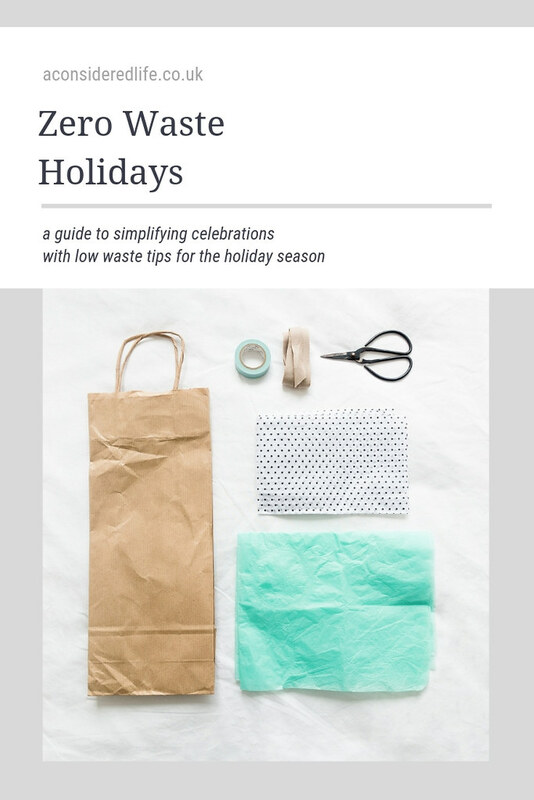 It can be hard to strip back the waste and overconsumption without stripping out the joy and fun of the holiday season, or so it might seem. My approach has always been to keep gifts simple and useful, and decorations to a minimum. It keeps impulsive consumerism and the waste it causes to a minimum without impinging on the joy and fun of holiday celebrations. Although this post was inspired by Christmas, all the tips I’ve shared could be applied to any holiday - even birthdays - where gifts are given, food is shared, and decorations are hung. Consumables - things people can experience, eat, or otherwise use up - are all good low waste gift options and often the most loved. Think: books, gift cards, homemade treats, tickets to a performance, locally made produce, or something very specific you know they want. If the people you know are reluctant to forgo gifting altogether (I’ve tried and failed at this approach! ), ask to see a wishlist of items they would like. At least then you know you are buying something that will be used. Jack and I don’t exchange gifts, instead we share them. We pick something we both want to experience or a big ticket item that would improve our lives. If you don’t need anything, politely request your friends and family don’t buy you anything. The exchanging of gifts should never be a burden or an expectation. Alternatively, if you know your request might fall on deaf ears; request only consumables in low waste packaging are gifted to you. Wrapping paper, the kind you purchase in a store, is almost always non-recyclable especially the glitter covered kind. 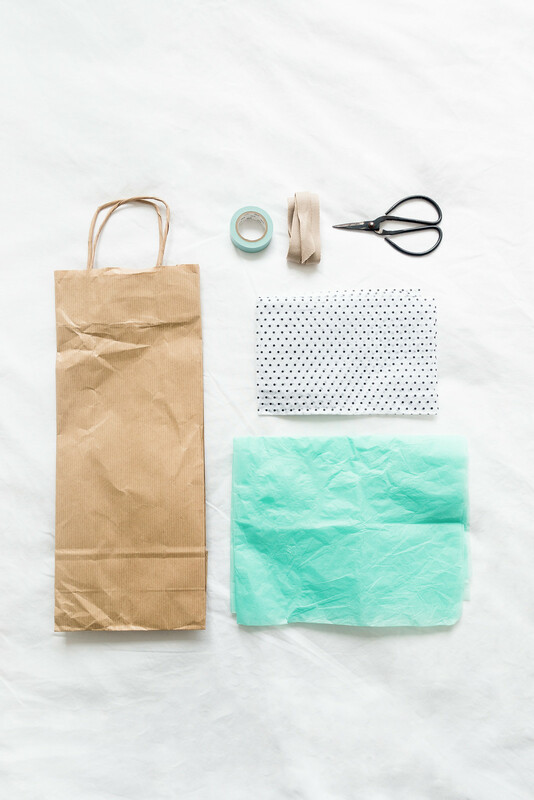 For wrapping gifts, use (and reuse) gift bags; use brown paper or scrap fabric for wrapping and pieces of ribbon string for tying; gift homemade items like cookies in glass jars. 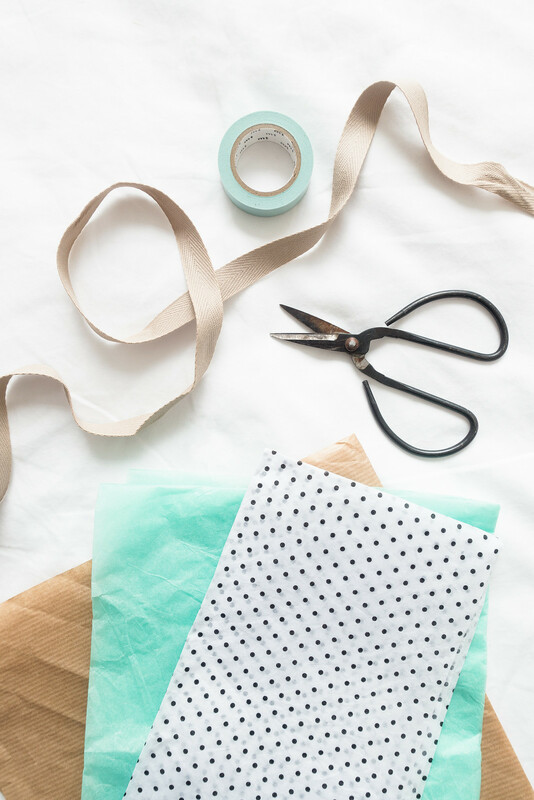 An eco-friendly alternative to plastic tape is gummed paper tape. Sprigs of wild flowers, Christmas tree clippings, or even fresh herbs look beautiful as gift wrap decorations. Throughout the year I stow away a supply of paper and packaging, ribbons, string, and gift bags from items gifted to me so whenever a celebration rolls around, I’m stocked up on gift wrap supplies. Whenever I have a gift to wrap, I have an assortment of gift wrapping at my finger tips. It lends gifts a much more personal touch than commercial wrapping paper. If you're in need supplies, I've found asking online shops to send in minimal packaging usually does the trick. Christmas is the only time I decorate my apartment, although my approach would be the same no matter the season: keep decorations to a minimum, make instead of buy them, and reuse wherever possible as often as possible. Instead of buying new decorations each year, make your own. Use scrap and natural materials, which can be recycled or composted after the celebrations are over, or make longer-lasting decorations, which can be cherished and reused for years. Alternatively, seek out secondhand decorations that have been donated to shops or are being sold online. If it were my choice alone, I wouldn’t have a Christmas tree. But there is an undeniable joy in decorating a tree; my partner loves having a one and who am I to deny that? We purchase ours through a local florist so we know our money is going to support a small independent. We decorate it with handmade objects we have been gifted by friends or made ourselves, and hang them alongside the same store-bought lights and baubles we use every year. Some holidays require a little dressing up. If you enjoy wearing costumes, avoid the single-use kind; make costumes from what you have or can find at secondhand stores, and swap them with friends. Accessories can be repurposed from your own wardrobe or recycling bin, and a little face paint goes a long way. Every year we host a Eurovision party where guests dress up to represent specific countries. It can be difficult to create a costume without causing any waste at all, however, wearing your own clothes, painting your face, shopping for props secondhand, and getting your hands dirty with a little DIY really limits the waste you create. 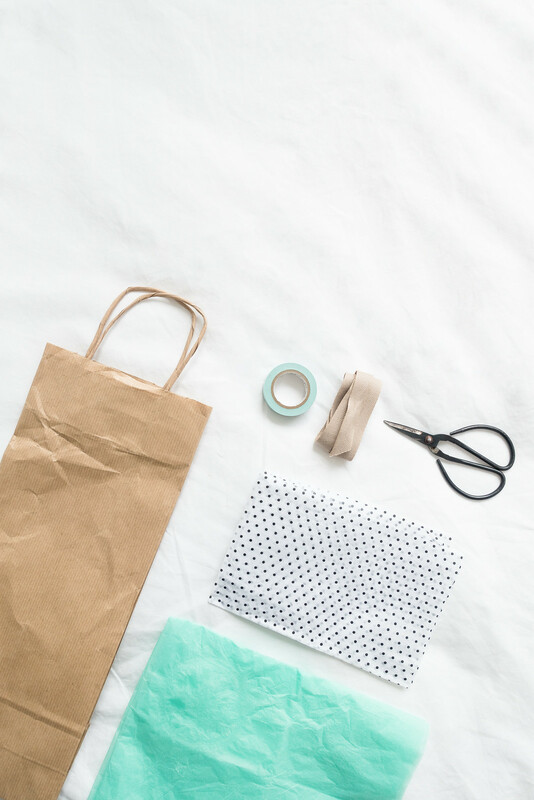 If you’re a really keen costume wearer who likes to dress up whenever the chance arises; get into the habit of stockpiling supplies like cardboard, paper, and scrap fabrics, and you’ll find yourself with more of the tools you need to make your own costumes in the future. Feasting on delicious food with friends and family is one of the most wonderful ways to celebrate during the holidays yet it’s often the biggest cause of waste but it doesn’t have to be. The tricks of avoiding food waste are the same as a typical day, except on a bigger scale. A little pre-planning and you don’t have to waste a thing. Avoid pre-packaged foods and cook from scratch as much as possible. Choose recipes that are delicious and use simple ingredients. If you’re hosting for a lot of guests, consider catering instead of purchasing individually packaged convenience foods. Use cloth napkins and tablecloths, and serve using real tableware instead of the disposable kind. We all know how tricky it can be to get portions exactly right and no one wants their guests to go hungry. Plan ahead to tackle the issue of leftovers by either offering for guests to take them home, give them to those in need, or freeze them for later. What are your suggestions for low waste celebrations?